Gonna be doing a bunch of walkaround shenanigans at this. The Penny-Farthing will also be in attendance! Clockwork Alchemy is the San Francisco area's own steampunk convention. Originally a part of FanimeCon, Clockwork Alchemy is now its own independent event celebrating music, makers, dancing, writing, crafting, fashion, and fun related to steampunk! Clockwork Alchemy 2019 will be held March 22-24, 2019, at the Hyatt Regency SFO in Burlingame, CA. 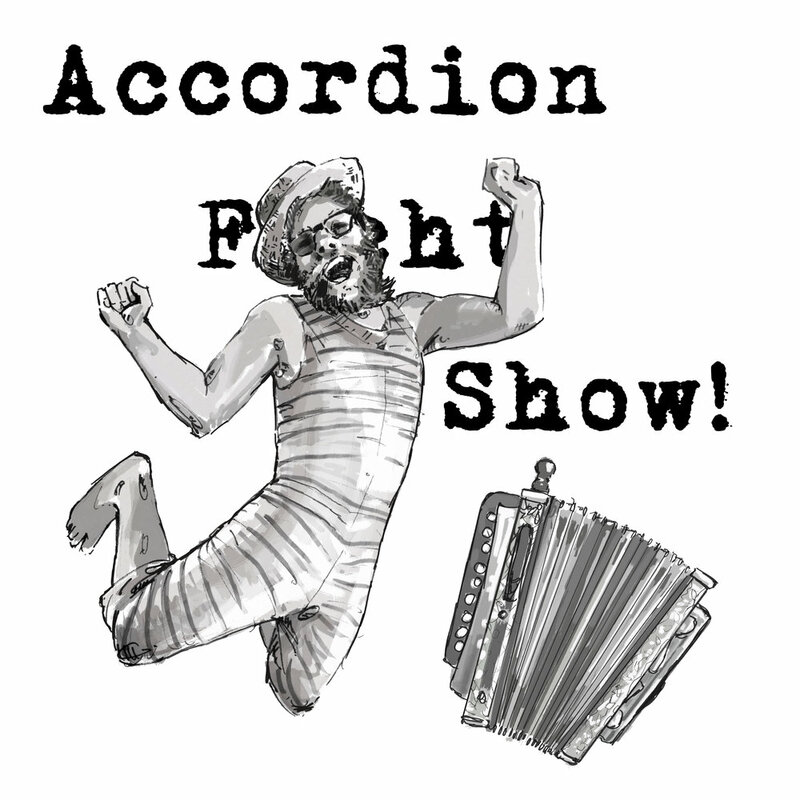 Accordion Fight Show @ Nugget Fringe - 2 Shows Only! Strangely’s “charismatic and slightly deranged” (OutInPerth.com) performance style is back! Fresh off a sell-out run at Edinburgh’s Fringe Festival, this “engaging ruffian’s...tour-de-force is impressive as his thong is thin!” (fringereview.co.uk) Prepare to sing along as you battle for fabulous prizes against the world's loudest, nakedest, accordionist! Seances with Strangely @ Nugget Festival! Noted accordion-playing-storyteller Strangely returns to Nugget with a quieter show exploring the spookier side of magic. Prepare yourself for an encounter with the supernatural in this intimate experience inspired by the occult explorations of centuries past. Not for the faint of heart. Seating is limited, reservations strongly recommended. 5 Shows! Click here for tickets! Strangely will be rampaging all over Clockwork Alchemy! Don't miss out! Find him and say hello! Stomp along to some grand tunes and get a couple of sweaty-beardy hugs! A Length of Rope Tour is a 501(c)(3) non-profit tour sponsored by Anchorage Community Works. This tour will circle the United States offering donation based performances and workshops across the country. Ariel Schmidtke's "A Length of Rope" explores the significant choices we come to in life, with a rope and trapeze suspended on opposing sides of each intersection. These two circus apparatuses represent the struggle of choosing between different directions—be it a choice of place, identity, friendship, or love. There is no fourth wall in this show, spectators can see Schmidtke's hands tremble from physical exhaustion and some portions are performed among the audience members. The show’s relatability and vulnerability invite audience members to project their own choices on the performance and explore for themselves their lost possibilities. In this way, the work is innovative, it pushes beyond circus, beyond drama, to a place of intimate connection. From emceeing to performing his own full-length show, Strangely will be joining the tour as a multifaceted performer. Strangely has trice circled the globe with his award winning, “rollicking, sing-along, one-man, cabaret riot” (Broadway Baby, Edinburgh) show Roaring Accordion. Never failing to impress, Strangely draws audiences into an epic world where anything can--and often does--happen. Ariel Schmidtke's A Length of Rope explores the significant choices we come to in life, with a rope and trapeze suspended on opposing sides of each intersection. These two circus apparatuses represent the struggle of choosing between different directions—be it a choice of place, identity, friendship, or love. There is no fourth wall in this show, spectators can see Schmidtke's hands tremble from physical exhaustion and some portions are performed among the audience members. The show’s relatability and vulnerability invite audience members to project their own choices on the performance and explore for themselves their lost possibilities. In this way, the work is innovative, it pushes beyond circus, beyond drama, to a place of intimate connection. Celebrate Spring with four of the Northwest's best singer-songwriters. Bellingham favorite Strangely is joined by his long-time collaborator Aaron J. Shay, for an evening of songs, stories and Mead. Also on hand are the incomparable Sarah Goodin and the eternally positive Pepper Proud. Northwest folk-punk raconteur's Strangely and Shay, present their multi-award winning collaboration show in Seattle for the first time. After two sell-out runs at Rogue Festival see what the fuss is all about! One Performace only! Two folk singers from the Northwest full of spit and vinegar, Strangely & Shay put on an energetic show full of sing-alongs and laughter! Accordionist Strangely T. Doesburg and banjoist Aaron J. Shay have been friends for years, performing together and touring cities both close to home and far afield, from Portland to Finland! With Strangely's bombastic charisma and Shay's earnest charm, they leave an audience smiling and humming a tune, no matter where they go! Click here for a FB event!